Bionic Briana: My American husband. My husband finally did it. 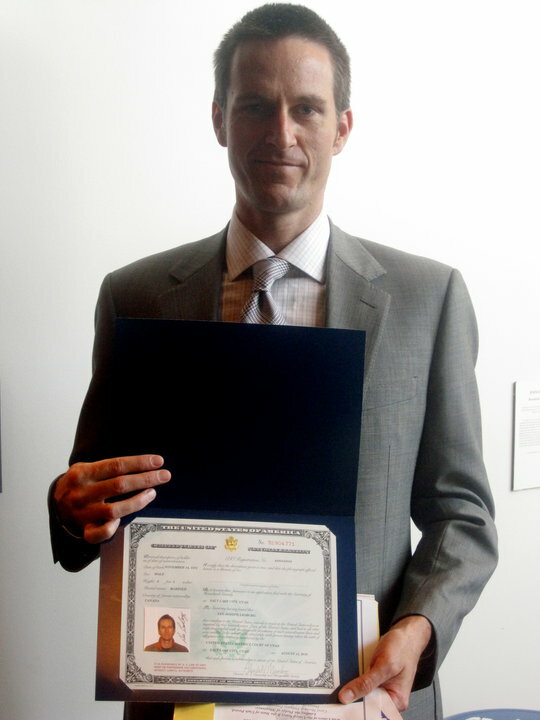 After 20 years of living in this country he took the plunge and became a U.S. citizen. He moved from a little town in Alberta, Canada when he was just 17 years old to the warm weather of Gainsville where he attended the University of Florida. He still identifies as a Canadian but, after living here for as long as he has, he wanted the opportunity for his voice to be heard in a political sense. Lee is a political junkie and enjoyed watching every second of the 2008 presidential election coverage. I think it hit him then that he would like to become an American so that he could join in on that process. I was so proud to be there for his naturalization ceremony and, although he is now an American, he will always be my Canadian husband.